And you thought the life of a shoe salesman was dull. That’s hardly the case at the new Aetrex high-tech concept shoe store in Englewood, New Jersey, which opened earlier this month. You won’t see anyone resembling the dour, luckless Al Bundy character from the old Married...With Children TV sitcom. Instead, you’re greeted with a bright, high-tech experience, highlighted by large touchscreens and the iStep computerized system for measuring and fitting your feet. Step here to get your feet measures! 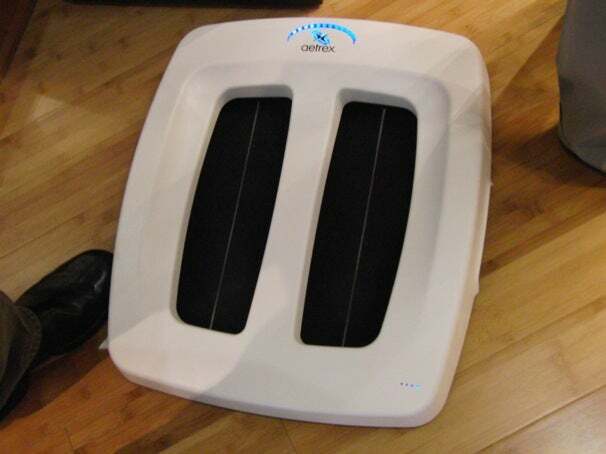 At the Aetrex store, the old Brannock Device, the familiar metal foot-measurement gadget with the sliding parts with orgins dating to 1927, has been replaced by the the iStep SP5000, a high-tech tool which a large bathroom scale or a foot bath. Under two conductive rubberized mats are 3,744 gold-plated barometric sensors, each a quarter of a centimeter square, which measure the arch in your foot and take individual foot-pressure readings. At the same time, 1,326 infrared LEDs and receptors on the inside edges of the iStep SP5000 measure the length and width of your foot, recording not your shoe size, but the exact dimensions. This is important, said an Aetrex representative, since shoe sizes vary between countries and shoe manufacturers. Any suggested shoe size is customized to the exact shoe you’re ordering. 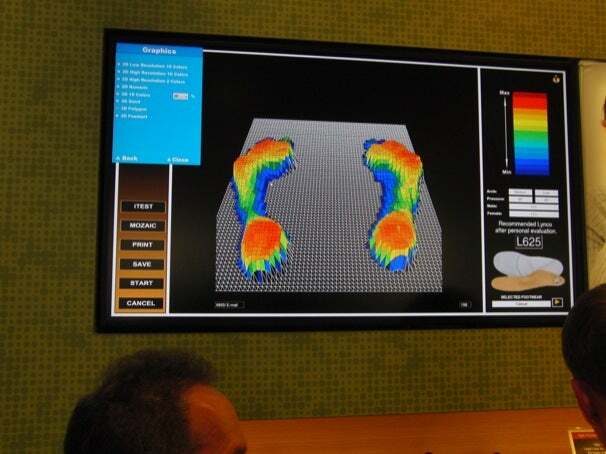 Within a few seconds a color pressure map of your feet appears on a large display, giving the shoe salesman a visual image of your arch and how your weight is distributed on your feet, thus allowing him to suggest additional padding and support products if needed. The data can be e-mailed to the customer or saved in a customer database for future use. A 3D visualization lets you see where you put the most pressure on your feet. The iStep SP5000 communicates to a PC via Bluetooth or it can be controlled with an iPhone app, which Joe Clarke, Aetrex iStep technology manager demonstrated as the feet of Larry Goodman, Aetrex executive sales director, were measured. The Aetrex foot-measurement and fitting technology is being marketed to other shoe manufacturers and stores. Former New York Giants quarterback Phil Simms (who attended this month's ribbon-cutting event), said that finding the right fit for his size-14 feet had been a problem since he was in high school. He said the fit of his Aetrex shoes, which has an internal pad which cups and supports his heel, had virtually eliminated the heel pain he used to suffer.